After my Master's graduation ceremony, my mother and I went down to Bella Italia for lunch. It was my mother's first time in England. We drank hot chocolate with Bailey's and tipped the waiter outrageously. 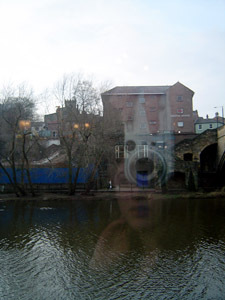 This was an accidental mirror shot out the restaurant window, looking at the River Wear.